Today’s Westfield Mission Valley visit offered up something even more surprising than seeing our first FlixBus. My wife suggested walking around the perimeter of the empty store where once was Macy’s—so we could be more in shade than sun. But turning from the parking lot side back towards the mall proper, we encountered police tape blocking off the area in shadows. Then we came upon the sign that is the Featured Image. 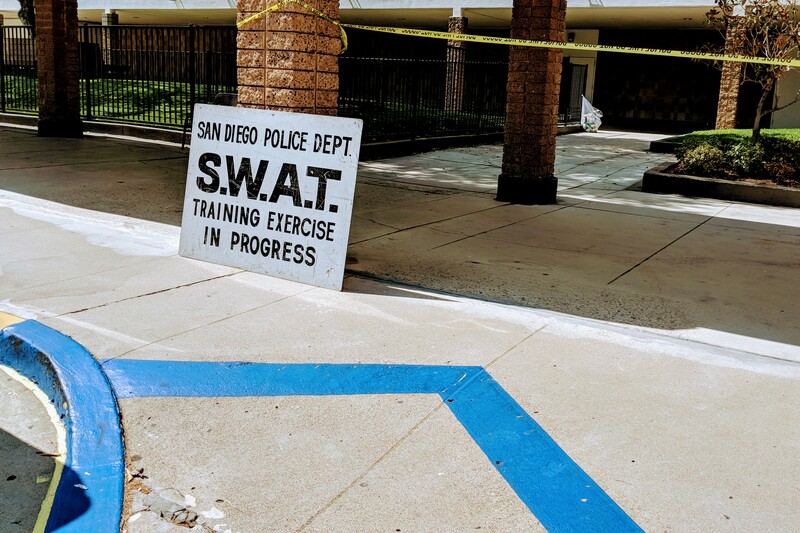 Think of all that empty square-footage an anchor department store leaves behind for SWAT to do God knows what—and he ain’t telling me—to prepare for incidents involving terrorists, Twitter rumormongers, or Trump-haters (of which there are too many in San Diego). Perhaps the police practiced hostage negotiation and rescue tactics. But all seemed quiet when Anne and I meandered by. Certainly we heard no muffled rat-tat-tat of assault rifles shooting blanks. Although, we did stand around long enough taking photos of the sign and yellow tape to be suspicious. Say, what’s that all black van parked across the street from my apartment, tonight? I captured the moment using my trusty Pixel 2 XL. Vitals: f/1.8, ISO 55, 1/2924 sec, 4.459mm; 2:56 p.m. PDT. Using Google Photos’ default editor, I cropped 3:2, straightened, and applied Palma filter.